Human epidermal growth factor receptor HER3 (ErbB3), especially in association with its relative HER2 (ErbB2), is known as a key oncogene in breast tumour biology. Nonetheless, the prognostic relevance of HER3 remains controversial. NEDD4–1 and NRDP1 are signalling molecules closely related to the degradation of HER3 via ubiquitination. NEDD4–1 and NRDP1 have been reported to contribute to HER3-mediated signalling by regulating its localization and cell membrane retention. 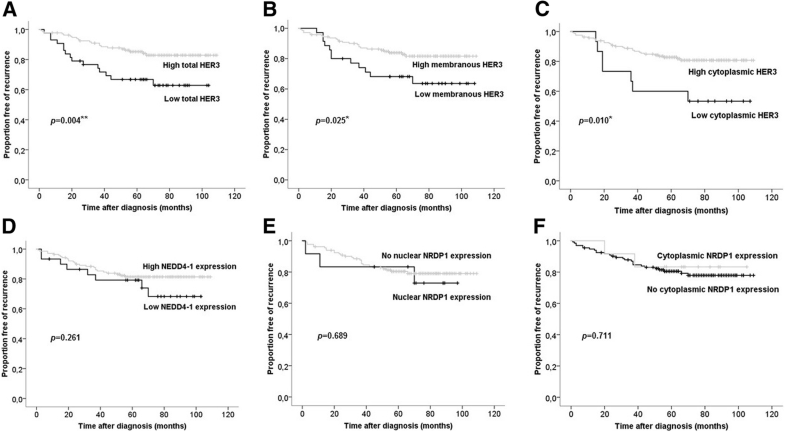 We studied correlations between HER3, NEDD4–1, and NRDP1 protein expression and their association with tumour histopathological characteristics and clinical outcomes. 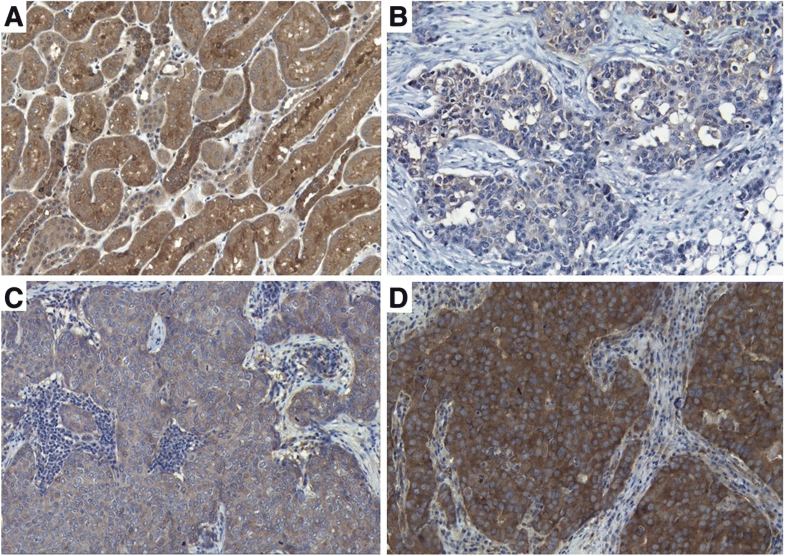 The prevalence of immunohistochemically detectable expression profiles of HER3 (n = 177), NEDD4–1 (n = 145), and NRDP1 (n = 145) proteins was studied in primary breast carcinomas on archival formalin-fixed paraffin-embedded (FFPE) samples. Clinicopathological correlations were determined statistically using Pearson’s Chi-Square test. The Kaplan-Meier method, log-rank test (Mantel-Cox), and Cox regression analysis were utilized for survival analysis. HER3 protein was expressed in breast carcinomas without association with HER2 gene amplification status. Absence or low HER3 expression correlated with clinically aggressive features, such as triple-negative breast cancer (TNBC) phenotype, basal cell origin (cytokeratin 5/14 expression combined with ER negativity), large tumour size, and positive lymph node status. Low total HER3 expression was prognostic for shorter recurrence-free survival time in HER2-amplified breast cancer (p = 0.004, p = 0.020 in univariate and multivariate analyses, respectively). The majority (82.8%) of breast cancers demonstrated NEDD4–1 protein expression - while only a minor proportion (8.3%) of carcinomas expressed NRDP1. NEDD4–1 and NRDP1 expression were not associated with clinical outcomes in HER2-amplified breast cancer, irrespective of adjuvant trastuzumab therapy. Low HER3 expression is suggested to be a valuable prognostic biomarker to predict recurrence in HER2-amplified breast cancer. Neither NEDD4–1 nor NRDP1 demonstrated relevance in prognostics or in the subclassification of HER2-amplified breast carcinomas. Human epidermal growth factor receptor HER3 (ErbB3), a cell membrane-associated protein encoded by the ERBB3 gene, is a promising target for cancer therapy, especially in HER2-positive (carrying ERBB2/HER2 gene amplification) breast carcinoma . Both HER3 and HER2 belong to a family of epidermal growth factor receptor (EGFR, HER) tyrosine kinases that activate after receptor dimerization. This culminates in the initiation of signal transduction pathways that markedly regulate cellular viability . When catalytically defective, HER3 is unable to homodimerize and orchestrate its own activation [2, 3]. HER3 is known to interact most preferably with its structurally homologous relative HER2 once bound with its ligand heregulin (HRG), also called neuregulin-1 [4–6]. Heterodimerization between HER2 and HER3 induces subsequent PI3K/AKT and Ras/Raf/MAPK signalling cascades . The presence of HER3, as an allosteric activator, is required to maintain active HER2-mediated signalling [8, 9], and aberrantly intensified HER2-HER3 signalling is hence critically associated with breast carcinogenesis and tumour cell proliferation [4, 10–12]. HER3 protein overexpression has been shown to commonly co-occur with HER2 gene amplification and HER2 overexpression, therefore, HER3 is thought to contribute markedly to the pathogenesis of HER2-amplified breast cancer subtype [4, 13, 14]. The co-expression of HER2 and HER3 proteins [15, 16] and abundance of HER2-HER3 heterodimers in situ have also been associated with adverse clinical outcomes in breast cancer [17–19]. The formation of HER2-HER3 heterodimers also inhibits HER3 downregulation . Due to the close interaction between HER2 and HER3, dual inhibitory therapy is preferred and clinically relevant treatment for carcinomas with altered HER2 signalling [8, 11, 21]. In addition to HER2-positive breast carcinomas, therapeutic targeting of HER3 receptors has been suggested also in the treatment of HER3-dependent, HER2-negative breast cancers to prevent cell growth-promoting signalling triggered by intensified HER3-HER1 heterodimerization . Several HER3-targeting molecules have been developed as therapeutics, and many of them are currently being tested in clinical trials [23, 24]. After a careful survey of the literature, it appears that the prognostic value of HER3 expression (at the protein or mRNA level) in breast cancer is controversial (Table 1). Overexpressed HER3 is mostly associated with a worse survival [16, 25–35], but conflicting results have also been published [36–40]. Many studies did not find any demonstrable relationships between HER3 and patient survival [15, 41–53]. Studies focusing on HER3 specifically in HER2-amplified breast cancer [16, 25, 26, 29, 31, 32, 37, 38, 41, 44, 45, 48, 49, 52, 54] have not drawn conclusive results either. Interestingly, HER3 activation has been implicated as a molecular mechanism inducing inherent or acquired de novo resistance to anti-HER2 therapy [19, 31, 55, 56]. Continuous inhibition of HER2 signalling may lead to compensatory HER3 activation, which results from heterodimerization between HER3 and its alternative dimerization partner HER1 [57, 58]. The exact mechanisms behind aberrant HER3 protein expression have not been fully elucidated . Unlike HER2, HER3 does not undergo gene amplification during breast carcinogenesis [16, 59, 60]. Cancer-related ERBB3 mutations are relatively uncommon, except for colon and gastric carcinomas [59, 61]. One hypothesis is that excessive cellular HER3 expression may be due to defects in downstream signalling mechanisms that regulate HER3 membrane trafficking . Aberrant expression of HER3 degradation regulators may lead to an abnormal accumulation or deficit of membrane-bound HER3 receptors, consequently influencing HER3 signalling efficiency. Here, we studied the expression of two proteins, NEDD4–1 (neural precursor cell expressed developmentally downregulated 4–1) and NRDP1 (neuregulin receptor degradation protein 1, also known as FLRF and RNF41), which are known to be necessary for HER receptor quantity control . NEDD4–1  and NRDP1 [64–67] are both E3 ubiquitin protein ligases suggested to crucially downregulate HER3 and its subcellular localization by mediating HER3 receptors to degradation via the ubiquitin-proteasome-pathway. Defects in ubiquitination are critical and lead to aberrant receptor activity and signalling . Hypothetically, HER3 overexpression may be associated with the concurrent absence of its ubiquitination regulators, NEDD4–1 and NRDP1. Low NEDD4–1 expression due to NEDD4–1 knockdown has been demonstrated to activate HER3 and increase cancer cell proliferation in vivo and in vitro . Conversely, NEDD4–1 overexpression has resulted in decreased HER3 expression and increased HER3 ubiquitination . Aberrant expression of NEDD4–1 has been implicated in the pathogenesis and adverse prognosis of several human malignancies [69–72]. Despite the frequent overexpression in breast cancer [73, 74], the prognostic value of NEDD4–1 remains unclear in the clinical context. NRDP1, in turn, is less frequently overexpressed than NEDD4–1 in breast carcinoma [75, 76]. NRDP1 overexpression has been shown to cause a decrease in HER3 expression and an inhibition of breast cancer cell growth in vitro . Conversely, a loss of NRDP1 followed by NRDP1 knockdown suppressed HRG-induced HER3 ubiquitination and degradation in MCF7 breast cancer cells . An inverse correlation between NRDP1 and HER3 expression in situ has been demonstrated in breast tumours derived from ERBB2 transgenic mice  and in human breast carcinomas . The prognostic and clinical significance of NRDP1 remains unknown. In the current study, we studied the association between HER3, NEDD4–1, and NRDP1 protein expression, clinicopathological characteristics and clinical outcomes in primary breast cancer, especially in the HER2-amplified subtype. Two separate archival sample collections of formalin-fixed paraffin-embedded (FFPE) primary breast carcinomas were used for biomarker analyses conducted in compliance with the REMARK guidelines . The first sample collection, “the BCA cohort”, consisted of 308 primary, invasive breast carcinomas that were diagnosed in the area served by Tampere University Hospital between 1990 and 1999. Of these carcinomas, 47 (15.3%) were characterized as HER2-positive based on HER2 protein overexpression. Lobular carcinomas were overrepresented in this cohort compared to the overall prevalence of this type of carcinoma (Table 2). This sample set was prepared as tissue microarray (TMA) sections and was originally established for another study, which has been described in more detail in publications by Korhonen et al. [78, 79]. Primary treatment for patients was conducted according to the existing clinical practice: surgery, post-operative radiotherapy, adjuvant cytotoxic chemotherapy (mostly CMF) and endocrine therapy (Table 3). The other sample collection, specified as the “HER2+ BCA cohort”, consisted exclusively of 177 HER2-amplified invasive breast carcinomas diagnosed during the years 2003–2007 in the Pirkanmaa Hospital District. The status of hormone receptors, oestrogen receptor (ER) and progesterone receptor (PR), HER2 gene amplification, and Ki67 proliferation index were determined during the diagnostic procedure, and related data were retrieved from the clinical records. HER2 gene amplification status was previously determined by the chromogenic in situ hybridization (CISH) technique. This sample set was prepared as whole tissue sections. Approximately half (n = 82) of the carcinomas, primarily patients diagnosed after June 2005, were treated with conventional chemotherapy combined with adjuvant trastuzumab during 9-wk schema as a first-line therapy  for primary disease. The remaining patients (n = 95) did not receive any adjuvant HER2-targeted therapy for primary disease. In addition to surgery and adjuvant cytotoxic chemotherapy (mostly consisting of taxanes, CEF), post-operative radiotherapy and adjuvant endocrine therapy were given when necessary (Table 3). Samples were selected for the current study according to the following inclusion criteria: availability of representative tumour tissue (FFPE), adequate pathological characterization, and clinical follow-up data. Clinicopathological data and follow-up information were collected, retrospectively. The mean follow-up period for recurrence-free survival (RFS) in the HER2+ BCA cohort was 5.3 years (range: 1 month to 9 years) and 10.4 years (range: 1 month to 22 years) for the BCA cohort. NEDD4–1 and NRDP1 expression was studied in a smaller fraction of the HER2+ BCA cohort representing available HER2-amplified cases (n = 145). Table 2 describes the clinicopathological characteristics of the study cohorts. For immunohistochemistry (IHC), serial four-μm-thick sections were cut from FFPE sample blocks and mounted on Super Frost Plus® slides followed by deparaffinization and dehydration. Heat-induced epitope retrieval (HIER) was performed in TE buffer (50 mM Tris 1 mM EDTA, pH 9) at 98 °C for 15 min. To determine HER3 protein expression, we used the optimized IHC staining protocol described in our earlier study . We used a mouse monoclonal (clone DAK-H3-IC) antibody against the human HER3 protein at a dilution of 1:100. The expression of basal epithelium cytokeratins 5 and 14 was determined using the same IHC protocol with an antibody cocktail composed of anti-human mouse monoclonal antibodies CK14 (clone LL002) and CK5 (clone XM26), both diluted at 1:150. Ki-67 expression was determined similarly in BCA cohort samples with mouse monoclonal Ki-67 antibody (clone BS4) at a dilution of 1:100. For NEDD4–1 IHC, we used rabbit polyclonal anti-NEDD4 WW2 domain antibody (dilution 1:750) to detect NEDD4–1 proteins. Bright Vision+ Poly-HRP-Anti-mouse/rabbit IgG kit (ImmunoLogic, AD Duiven, the Netherlands) and 3,3′-diaminobenzidine tetrahydrochloride DAB-2V kit (Nichirei Biosciences Inc., Tsukiji, Chuo-ku, Tokyo, Japan) were used for the detection of immunoreactivity according to manufacturers’ instructions. To detect the NRDP1 protein, we used rabbit polyclonal FLRF/RNF41 antibody (dilution 1:3000), EnVision™ FLEX High pH HRP and EnVision™ FLEX DAB+ reagents (Dako, Glostrup, Denmark), according to manufacturers’ protocols. After staining, slides were counterstained with Mayer’s Hematoxylin (Oy FF-Chemicals Ab, Haukipudas, Finland) with 1:4 addition of 2% copper sulfate to intensify the DAB reaction. Slides were then dehydrated, cleared with xylene and sealed with DePeX mountant. All staining reactions were conducted using the LabVision™ Autostainer 480S platform. As positive control samples, we used human FFPE tissues known to express the specified proteins: normal prostate ductal cells for HER3 , kidney proximal tubule cells for NEDD4–1 , testicular cells in seminiferous ducts and mononuclear blood cells for NRDP1 . A negative staining control was prepared by omitting and replacing the primary antibody with diluent reagent and was included in each staining batch. An additional file 1 and Table 4 present detailed information on antibodies and IHC-staining protocols used in the current study. Samples stained for HER3, NEDD4–1 and NRDP1 were scanned with SlideStrider (Jilab Inc., Tampere, Finland) into digital images that were examined virtually with JVSview JPEG2000  and SlideVantage 1.2 (Jilab Inc., Tampere, Finland) viewer applications. The ImmunoRatio 2.5 application was used for automated cell counting of distinct cancer cells with nuclear immunoreactivity . Staining patterns were analysed within the invasive cancerous tissue area displaying the most intense brown DAB reaction (region of interest, ROI). For HER3 appearance, both membranous and cytoplasmic staining reactions were inspected on a computer screen. Samples were classified according to the staining intensity and proportion of specifically stained cancer cells as previously described . Briefly, HER3 staining localized to the cancer cell outer membrane was considered ‘membranous’ and was scored according to the following criteria: (0) absent/low staining (< 10% of cells), (1+) intermediate circumferential staining (10–30% of cells) and (2+) strong circumferential staining (> 30% of cells). The staining reaction observed in the cancer cell cytoplasm was considered ‘cytoplasmic’ and was categorized as (0) no/faint staining, (1+) overall low-intensity staining, and (2+) prevalent high-intensity staining covering most of the cancer cells. Score 1+ was set as a threshold to define HER3 positivity both for membranous and cytoplasmic staining. Total HER3 staining was designated as negative for cases with low (0/1+) membranous staining concurrently with low (0/1+) cytoplasmic staining and as positive for cases with high (2+) membranous and/or (2+) cytoplasmic staining. The NEDD4–1 protein expression pattern was analysed by scoring the staining intensity as follows: 0 (no staining), 1+ (weak), 2+ (moderate), and 3+ (strong). Samples with scores < 3+ were seen as NEDD4–1 negative ‘low expressing’ and samples with score 3+ as NEDD4–1 positive ‘high expressing’. Overall, the NEDD4–1 staining pattern in cancerous areas was homogenous, and therefore, the percentage of stained cells was not evaluated. NRDP1 staining was analysed by applying a scoring system presented in a study by Jiao et al. . We analysed nuclear and cytoplasmic staining separately. Staining intensity was scored accordingly: 0 (no staining), 1 (weak), 2 (moderate), and 3 (strong). Based on the percentage of stained cancer cell nuclei, samples were classified as 0 (< 1%), 1 (1–24%), 2 (25–49%), 3 (50–74%), and 4 (75–100%). The grades were then multiplied to determine a score for low and high nuclear expression. Cases with scores ≤3 were defined as ‘low expressing’ and those with scores ≥4 as ‘high expressing’. Cytoplasmic NRDP1 expression was categorized as high if the staining intensity in the tumour cells was moderate or strong. Expression patterns of basal epithelium cytokeratins 5 and 14 and Ki67 protein were analysed with Olympus System Microscope BX43. Carcinomas were interpreted as positive for CK5 and CK14 expression if more than 20% of the malignant cells displayed clear cytoplasmic staining . For Ki67 protein expression, we used a 20% cut-off value to determine low (< 20%) and high (≥20%) cell proliferation activity . All statistical data analyses were performed using IBM® SPSS® Statistics version 23 (IBM Corp.). Generally, p-values < 0.05 were considered statistically significant for any relationship being considered. Proportions among categorical variables were compared using Pearson’s Chi-Square test to determine clinicopathological correlations. Kaplan-Meier survival analysis and log-rank test (Mantel-Cox) were used to compare survival differences for each categorical variable. RFS time was chosen as the endpoint for the current study. To determine RFS, patients were followed from the date of surgery for initial diagnosis to the date of disease progression as local recurrence or distant metastasis. Patients who did not experience recurrence during the follow-up were censored at the time of death or last date of medical record inspection. In the BCA sample set consisting of HER2-positive and -negative breast carcinomas (BCA cohort), high membranous HER3 expression was observed in half of the cases (51.9%, 160 of 308). Nearly all (95.8%, 295 of 308) carcinomas showed HER3 protein expression localized in the cancer cell cytoplasm. When the total cellular HER3 expression pattern was evaluated, the majority (75.3%, 232 of 308) of carcinomas were classified as HER3-positive, ‘high total HER3 expressing’. One-fourth of the carcinomas (24.7%, 76 of 308) were determined to be HER3-negative, ‘low total HER3 expressing’. Figure 1 shows examples of membranous and cytoplasmic HER3 IHC staining patterns observed in the present study. To determine whether HER3 protein expression is common in HER2-amplified breast cancer subtype, we also studied HER3 expression in the HER2+ BCA cohort established for this purpose. We noticed that 80.2% (142 of 177) of HER2-amplified breast carcinomas showed complete circumferential membrane staining for HER3. Cytoplasmic HER3 staining was more common, since only a small fraction (8.5%, 15 of 177) of these carcinomas were completely unstained. High total HER3 expression was demonstrated in 75.7% of cases (134 of 177), and one-fourth of carcinomas were designated as HER3-negative. Overall, HER3 protein was heterogeneously expressed within the cancerous areas represented in whole tissue sections. The HER3 staining pattern was, therefore, equally evaluated from the ROI showing the most intense DAB reaction (Fig. 1). Next, we studied NEDD4–1 and NRDP1 protein expression in a cohort of HER2-amplified breast carcinomas. Most of the cases (82.8%, 120 of 145) demonstrated strong-to-moderate NEDD4–1 staining localized predominantly in the cytoplasmic region (Fig. 2). Approximately one-fifth (17.2%, 25 of 145) of the cases were categorized as NEDD4–1 low expression based on faint IHC staining reaction. The staining intensity and subcellular localization of NEDD4–1 protein were homogenous within the cancerous areas. Cells in histologically normal breast ducts were also positive for NEDD4–1. NRDP1 protein expression was uncommon in HER2-amplified breast carcinomas. NRDP1 localization in carcinoma cells was clearly nuclear or cytoplasmic (Fig. 3). The high presence of nuclear or cytoplasmic NRDP1 protein was observed in a minor proportion (8.3%, 12 of 145) of samples, while the majority of carcinomas (91.7%, 133 of 145) were classified as low for NRDP1 expression. In the BCA cohort, we noticed that HER3 protein expression was not dependent on HER2 status irrespective of its cellular localization (membranous p = 0.615, cytoplasmic p = 0.990, total p = 0.882). In addition, we found that low membranous HER3 protein expression was associated with an aggressive triple-negative breast cancer (TNBC) phenotype (p = 0.000), defined as concurrently negative ER, PR, and HER2 statuses. Similarly, negative PR receptor status alone (p = 0.002) and larger tumour size ≥2 cm (p = 0.003) were related to low membranous HER3. Cytoplasmic or total cellular HER3 expression were not associated with any particular clinicopathological characteristics (Table 5). HER3 expression was not related to neither cellular proliferation activity (Ki67) nor lymph nodal status. When the BCA cohort was analysed and stratified for HER2 status, we noticed that clinicopathological correlations were statistically significant only in HER2-negative carcinomas. In this group, low membranous HER3 expression was strongly associated with negative ER (p = 0.003) and negative PR (p = 0.002) statuses, high (III) grade (p = 0.008) and larger (≥2 cm) tumour size (p = 0.006). In a cohort of 177 HER2-amplified breast carcinomas, low HER3 expression was related to clinicopathological characteristics known to predict poor clinical outcome, with the exception of the cell proliferation marker Ki67, which was not shown to associate with HER3 (Table 5). Low membranous HER3 expression was associated with negative ER status (p = 0.013). Low cytoplasmic HER3 expression, in turn, was related to large tumour size (≥2 cm, p = 0.014 or pT3-pT4, p = 0.001), young patient age (< 50 years) at diagnosis (p = 0.000), and premenopausal status (p = 0.000). 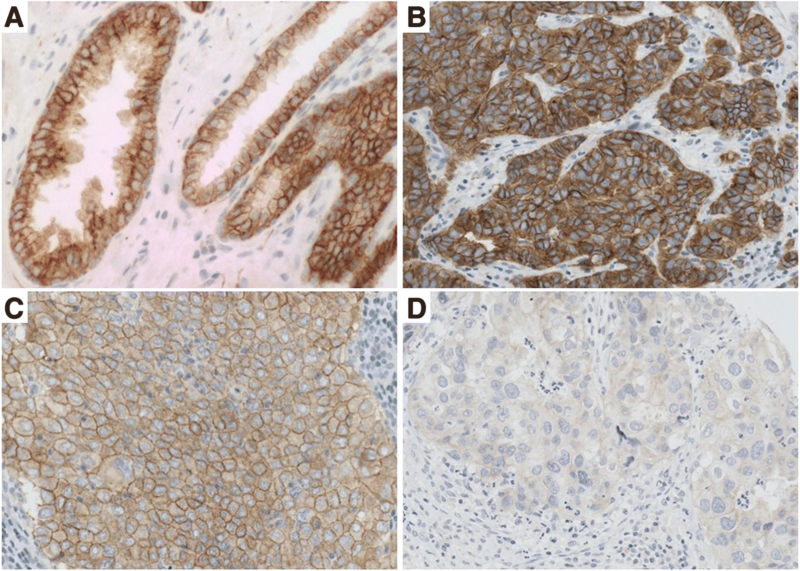 Carcinomas with low total cellular HER3 expression were associated with lymph nodal infiltration (p = 0.035), cytokeratin proteins 5 and 14 expression (p = 0.006), and basal phenotype (p = 0.001). Basal phenotype was determined by concurrent cytokeratin 5/14 expression and negative ER status . For NEDD4–1 and NRDP1, we found few clinicopathological correlations (Table 6). High NEDD4–1 expression was shown to correlate with high expression of the cell membrane-located HER3 protein (p = 0.002). The majority (87.4%, 104 of 119) of carcinomas showing high membranous HER3 expression were demonstrated to co-overexpress NEDD4–1 protein. In a group of carcinomas with low membranous HER3 expression, NEDD4–1 was negative in 38.5% (10 of 26) of carcinomas. High cytoplasmic NRDP1 expression was observed mainly in PR-positive breast carcinomas (p = 0.006) and correlated with total HER3 expression (p = 0.041). Low nuclear NRDP1 expression was observed mostly in carcinomas diagnosed in patients aged ≥50 years (p = 0.004). Neither nuclear nor cytoplasmic NRDP1 protein expression was associated with NEDD4–1. In the BCA cohort, approximately one-third (36.4%, 112 of 308) of breast carcinomas developed metastatic disease recurrence during the long-term follow-up period lasting up to 22 years (mean 10.4 years). Lymph nodal infiltration pN+ (p = 0.000), tumour size of pT3-pT4 (p = 0.009), TNBC phenotype (p = 0.006), histological grade III (p = 0.007), and PR negativity (p = 0.035) were shown to predict breast cancer recurrence in univariate analysis (log-rank Mantel-Cox). Of these, only lymph nodal spread was of prognostic utility (p = 0.002, Exp (B) 2.145) for shorter RFS in multivariate Cox regression analysis. HER3, in turn, was not associated with the clinical outcome of breast cancer. During the mean follow-up time of 5.3 years (range 1 month to 9 years), 20.3% (36 of 177) of HER2-amplified breast cancer cases experienced recurrence of the disease. Distantly located metastases (61.1%, 22 of 36) were more common than local relapses (38.9%, 14 of 36). Altogether, 18.3% of patients receiving adjuvant trastuzumab therapy experienced relapse, while 22.1% of patients treated without trastuzumab were relapsing during the follow-up (p = 0.573). According to the univariate log-rank analysis, we found lymph nodal infiltration (p = 0.000), tumour size of pT3-pT4 (p = 0.000), and low total cellular HER3 protein expression (p = 0.004) as strong indicators of shortened RFS in HER2-amplified breast cancer (Table 7, Fig. 4). The estimated mean RFS time was shortened as follows: RFS for pN+ (vs. pN0) carcinomas was 6.7 (8.4) years, for pT3-pT4 -sized tumours (vs. pT1-pT2) 4.2 (7.9) years, and for low (vs. high) total HER3 expressing carcinomas 6.3 (8.0) years. We also found statistical significance for low membranous (p = 0.025) and cytoplasmic (p = 0.010) HER3 expression in predicting breast cancer recurrence during the follow-up period (Table 7, Fig. 4). Low total cellular HER3 expression was demonstrated to find relapsing HER2-amplified breast carcinomas most efficiently; 41.7% (15 of 36) of cases with recurrence were shown to demonstrate low total cellular HER3 expression. Correspondingly, one-third of relapsing carcinomas (33.3%, 12 of 36) were classified as low for membranous HER3 expression, and one-fifth (19.4%, 7 of 36) were classified as low for cytoplasmic HER3 expression. When survival analyses were performed and stratified according to adjuvant trastuzumab therapy, we observed that low total cellular and cytoplasmic HER3 expression were of prognostic utility only in a cohort treated without adjuvant trastuzumab. Based on that data, we do not see HER3 as a useful biomarker to predict the effectiveness of adjuvant trastuzumab, at least when complied with the 9-wk regimen represented in a fraction of patients in the HER2+ BCA cohort. Based on univariate analyses, lymph nodal involvement (pN+), tumour size of pT3-pT4 and low total cellular HER3 expression were consequently tested for their prognostic value in multivariate Cox regression analysis. All of these categorized variables were independent negative prognostic factors of HER2-amplified breast cancer. Low total cellular HER3 protein expression was shown to increase the risk of breast cancer recurrence by 2.3-fold relapse risk, positive lymph nodal status 3.5-fold, and tumour size of pT3-pT4 by 4.0-fold (Table 7). NEDD4–1 and NRDP1 expression did not show any prognostic value for predicting the outcome of HER2-amplified breast cancer in terms of recurrence-free survival (Fig. 4). Additionally, neither NEDD4–1 nor NRDP1 expression was predictive of the efficiency of short-term (9-wk schema) adjuvant trastuzumab therapy. The role of HER3 in breast cancer biology has been extensively studied, especially in the context of personalized cancer therapy . The current study confirmed the predominance of HER3 protein expression in primary breast cancer, as detected by IHC. The majority (75%) of breast carcinomas were shown to display intense HER3 expression irrespective of HER2 status. From a therapeutic perspective, this provides a rationale for HER3-targeted pharmaceuticals, which are defining the state of the art in breast cancer therapy, especially for HER2-amplified subtype. The role of anti-HER3 therapy in the treatment of HER3-dependent, non-HER2-amplified breast carcinomas has also been speculated recently . However, e.g. lumretuzumab, in combination with pertuzumab and paclitaxel, was not confirmed clinically relevant therapy for patients with HER3-positive, HER2-low breast cancer , although was demonstrated effective in HER2-low/ER+ mouse xenograft model in vivo when combined with pertuzumab and endocrine (fulvestrant) therapy . Interestingly, we found that low HER3 expression was associated with features that commonly define breast cancer aggressiveness: large size (≥pT3), axillary lymph nodal infiltration (pN+), negative ER status, triple-negativity (ER-, PR-, HER2-) and basal phenotype (CK5/14+, ER-). However, we were not able to find a statistically significant association between low HER3 expression and high proliferation activity (indicated by the Ki-67 proliferation index), which supports the recently published result by Takada et al. . On the contrary, Kirouac et al. reported earlier that HER2-positive breast cancer cells showing lower proliferation activity in vitro have concomitantly higher HER3 expression levels. Our results demonstrate that low HER3 protein expression is indicative of shorter RFS in HER2-amplified breast carcinomas. Negative or low HER3 status was shown to independently increase the risk of breast cancer recurrence by two-fold. In the multivariate analysis, low membranous HER3 and low total cellular HER3 expression were prognostic factors for relapse occurrence, with well-known poor outcome determinants lymph nodal infiltration (pN+) and large tumour size (≥pT3). Despite extensive research focusing on HER3 over the past twenty years, its clinical utility in cancer prognostics - specifically in breast cancer - remains undefined , as has been reviewed within the current study (Table 1). When focusing on breast cancer, there are studies linking HER3 overexpression to unfavourable outcome, and others, such as the current study, that adversely associate low HER3 (mRNA or protein) expression with worse prognosis. However, some studies did not find any association between HER3 and breast cancer outcome. In addition, only some of the studies have focused on the HER2-amplified breast cancer subtype, in which HER signalling is specifically different from other subtypes . Considering survival data, one should remember that the pattern of recurrence is already dependent on the intrinsic subtype , which for we have inspected our results stratified for HER2 status. One explanation to elucidate the HER3 survival context in HER2-amplified breast cancer subtype could be related to intensified HER2 signalling because of paradoxical HER2 homodimerization in carcinomas with concurrently low HER3 but high HER2 expression due to amplified HER2. It has been previously confirmed that HER2 homodimerization is frequent, especially in breast carcinomas characterized by HER2 gene amplification, and is related to reduced RFS . In the present study, we did not find any survival differences when HER2-negative breast carcinomas (BCA cohort) with normal HER2 signalling were stratified for HER3. Earlier studies [15, 37] support that patients having both high HER2 and HER3 expression have significantly longer time to disease progression compared to patients having either high HER2 or HER3 expression in their carcinomas. Based on these observations, HER3 cannot be considered an independent prognostic factor in breast cancer overall because its clinical impact is mostly dependent on the co-expression of other HER receptors, such as HER2. Accordingly, we suggest that the HER2-HER3 interaction and its effects on growth-promoting signalling in HER2-dependent carcinomas are biologically different from carcinomas with low HER2 expression. For this reason, the prognostic applicability of HER3 should be analysed separately in breast cancers stratified for HER2 status. Additional intrinsic factors, such as the absence of HRG in HER3-overexpressing carcinomas, may also explain the finding of favourable outcomes in carcinomas characterized by high HER3 protein expression. HER3 activation is suggested as one mechanism to account for inherent or acquired resistance to anti-HER2 therapies [19, 31, 55, 56]. The high presence of HER3 mRNA has been related to a better prognosis in patients carrying HER2-positive breast carcinoma treated with adjuvant pertuzumab therapy . HER3 protein overexpression, for its part, has been shown to predict poor outcome in a group of HER2-positive breast cancer patients receiving adjuvant trastuzumab as a first-line therapy [25, 29]. In contrast, a recently published study  postulates that HER3 is not an informative biomarker to predict trastuzumab sensitivity. Overall, it seems that the expression profile of any single HER protein, in addition to HER2, is insufficient to predict the trastuzumab response. This is due to a complicated signalling network involving interacting HER receptors, their ligands and downstream signalling proteins [38, 49, 95]. We also analysed HER3 expression and RFS in a subgroup of patients who received adjuvant trastuzumab therapy. In the current study, HER3 expression was not shown to be predictive for adjuvant short-term (9-wk regimen) trastuzumab therapy as a first-line therapy. The recurrence rate and relapse-free survival time during the follow-up were not markedly different when stratified according to adjuvant trastuzumab therapy. Presently, one year is the recommended standard for trastuzumab therapy duration, which is based on clinical proof of prolonged survival compared to a shorter administration regimen [96–98]. This may have affected the observed recurrences in HER2+ BCA cohort, and is considered as a limitation of this study when applying these results in the current clinical practice. The expression of HER3 receptors differs specifically from its close relative HER2. Unlike HER3, HER2 tightly attaches to the cell membrane when trafficked from the Golgi apparatus to its putative membranous location, remaining there for prolonged periods [99, 100]. This enables reliable detection and localization of HER2 protein by IHC. In contrast, HER3 receptors are unstable and constitutively internalized from the cell membrane into the cytoplasm and nucleus [101–103], which complicates the detection of this receptor type by IHC. Once internalized, HER3 is quickly ubiquitinated and transferred to proteasomes for degradation. Due to the continuous trafficking of HER3 receptors, the appearance of membrane-bound HER3 receptors does not necessarily conform the efficiency of HER3 protein synthesis machinery at the transcriptional level. There are many mechanisms in distinct facets of HER3 protein synthesis that can be disabled when HER3 is down- or up-regulated . In addition, abnormal cellular HER3 receptor quantity or localization may be due to altered HER3 degradation mechanisms or the presence of exogenous stimuli with regulatory capacity on HER3 [102, 104, 105]. In the current study, we also demonstrated the expression of two regulatory proteins, NEDD4–1 and NRDP1, both of each contribute to the maintenance of HER3 receptors by mediating the degradation process via ubiquitination. We demonstrated that NEDD4–1 protein was predominantly over-expressed in HER2-amplified breast carcinomas; herein, 83% of carcinomas were positive for NEDD4–1. Only one earlier study clarified the NEDD4–1 protein expression pattern in breast cancer and demonstrated NEDD4–1 expression in 55% of studied cases . This earlier finding is not fully comparable with the current result because of the minor representation of HER2-positive breast carcinomas. To the best of our knowledge, this is the first study to clarify the relationship between HER3 and NEDD4–1 proteins in primary breast cancer tissue in situ. In contrast to our expectation from the theoretical perspective , HER3 protein expression was not negatively associated with NEDD4–1 expression. In fact, we found a statistically significant parallel correlation between membranous HER3 and NEDD4–1 expression. Based on our data, we hypothesize that HER3 trafficking out from the cell membrane preceding its degradation is under more complicated controlling mechanisms than NEDD4–1 expression alone. NRDP1 protein expression was infrequent and did not show any clinically meaningful correlations or prognostic potential to predict the outcome of HER2-amplified breast cancer. The absence of cytoplasmic NRDP1 expression was more common in carcinomas characterized by low cellular HER3 expression but was not otherwise associated with HER3. However, only 8.3% of carcinomas in all were shown to display nuclear or cytoplasmic NRDP1 protein expression in our HER2-amplified breast cancer cohort. Consequently, frequent HER3 expression in HER2-dependent breast cancer subtype does not seem to inversely associate with NRDP1 expression, but the result needs to be confirmed in a larger sample cohort because of relatively low NRDP1 expression observed in the current study. We speculate that low NRDP1 expression in HER2-amplified breast cancers could be mechanistically explained by the previous study of Yen et al. , in which NRDP1 loss was shown to enhance HER2/HER3-dependent breast tumour cell growth and tumour progression. We found only one earlier study focusing on NRDP1 expression in clinical breast cancer cohort. In this study , absent or low NRDP1 protein expression (approximately 42% of carcinomas) was related to worse breast cancer outcome during the ten-year follow-up period. NRDP1 expression was shown more common (approximately 58% of carcinomas) than we indicated in the current study. Comparable criteria for determining the NRDP1 expression was applied in both studies, but the IHC staining procedures and sample cohort characteristics, especially for HER2 status, were not similar and may explain the difference. To further clarify the biological and prognostic relevance of HER3 in the therapy context of HER2-amplified breast cancer, many continuing research objects seem necessary. The determination of HER3 expression in metastatic lesions of breast carcinomas treated with anti-HER2 therapy, such as trastuzumab, would elucidate the concept of intensified HER3 signalling due to HER2 downregulation. HER3 upregulation has been related to trastuzumab resistance in studies [19, 106] showing that breast cancers driven primarily by HER2 homodimerization are more susceptible to trastuzumab therapy than tumours with a predominance of HER2-HER3 heterodimers. From this context, it would be interesting to determine HER3 expression in breast carcinomas that are confirmed intrinsically resistant to trastuzumab. To elucidate the therapeutic predictive potential of HER3, one intriguing thought is to clarify HER3 expression retrospectively in breast cancer patients who were subsequently treated with adjuvant pertuzumab or novel HER3-targeting antibodies. The results of the current study suggest HER3 as a novel versatile biomarker to predict recurrence of HER2-amplified breast cancer. Irrespective of its subcellular localization, absent or low HER3 expression was associated with shorter RFS time when compared to HER3-overexpressing breast carcinomas. Low HER3 expression was associated with clinicopathological characteristics related to more aggressive and therapeutically unfavourable breast cancer types, such as axillary lymph nodal infiltration, larger tumour size, young patient age, negative ER status, triple-negative subtype, and basal phenotype. HER3 did not show any predictive value for the benefit of short-term (9-wk) adjuvant trastuzumab therapy as a first-line therapy. The HER3 degradation regulators NEDD4–1 and NRDP1 did not show any clinically meaningful correlations or predictive or prognostic applicability in HER2-amplified breast cancer subtype. The authors thank Mrs. Kristiina Salonoja and Mrs. Sari Toivola for their excellent technical assistance. This research was financially supported by the Competitive State Research Financing of the Expert Responsibility area of Tampere University Hospital, and Doctoral Program in Medicine and Life Sciences at University of Tampere (to S.L.). The funding bodies had no role in the study design, data collection, analysis and interpretation, or in writing the manuscript. The datasets used and analyzed in the current study are available from the corresponding author on reasonable request. The datasets supporting the conclusions of this article are included within the article and its additional files. SL, MT and JI designed the study. SL and SS harvested retrospectively clinical follow-up data and diagnostic information from the pathological review of cancer samples. AK provided the BCA sample set and derived clinical data. SL conceived the study in practice, performed data analysis and wrote the manuscript. All authors contributed to data interpretation, read and approved the final manuscript. The use of the tumour samples and patient records in this study was approved by the Ethics Committee of Pirkanmaa Hospital District (references no. R07082, R00143), the Ministry of Social Affairs and Health, and the National Authority for Medicolegal Affairs in Finland. The need for informed consent was waived by the aforementioned authorities due to the large number of samples and the fact that a sizeable portion of the patients were already deceased. Individual patient data has not been made available and the dataset has been handled anonymized. None of the authors declares any conflicts of interest. The Human Protein Atlas. https://www.proteinatlas.org/. Accessed 5 Jan 2018. JVSview JPEG2000 viewer application. http://jvsmicroscope.uta.fi/?q=jvsview. Accessed 21 Feb 2018.